We carry a stock of more than 100 cars at our warehouse location, visited by customers from all over the country and world. Please see our new inventory list. We update our website everyday. Gullwing Motor Cars Specializes In.... We specialize in European cars such as Mercedes Benz, Rolls-Royce, Bentley, Bugati, Austin Healey, Jaguar, Porsche, Ferrari, MG, Triumph, Maserati, Morgan, Pesago, Avanti, Alfa Romeo, Aston Martin, Delorean, Delage, Delahaye, Dualghia, Lotus,Lamborghini and various others and American cars such as American Bantom, Buick, Chevrolet - Corvette, Impala, Camaro, Cadillac, Ford - Mustang, Thunderbird, Plymouth - Cuda, Cord, Fiat - Toplino, Jolly, Duesenberg, Packard, Pontiac GTO, Lincoln, Auburn, Pierce Arrow, Excalibur, Plymouth, Studbaker and various others. 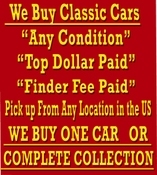 We thank you again, and welcome any inquiries you may have for any cars that might be of interest to you.